This is decoding of pictogram Yarnbury Castle, nr Winterbourne Stoke, Wiltshire. Reported 16-th May 2010. Yarnbury Castle is really a main object of this pictogram which extraterrestrial civilizations (ETC) transfer to mankind. This information complex consists of three parts-pictograms. Information in general of this complex: Humanity has to make the transition from an individual consciousness of human being to the united consciousness of mankind. Why it is very important to do so we will explain. First pictogram (fig. 1) is an individual information cell. It is a presentation of human being at information level of the Universe. The same as human being, it consists of two parts: a brain area – a small dark circle in the center, and the area of a body – located between border and brain area. The structure of a cell defines a level of consciousness of its object. Third pictogram – Yarnbury Castle (fig. 3). 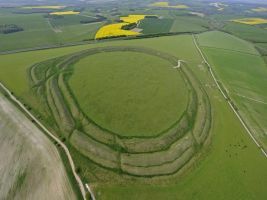 Yarnbury Castle also represents an information cell, but the united consciousness cell of mankind. It is characterized by expanded area of a brain. In order to present this cell extraterrestrial civilizations used ruins of Yarnbury Castle. Second pictogram – an arrow (fig. 2). It put together two pictograms: fig. 1 and fig. 3 in order to point on the transition individual consciousness to the united consciousness of all mankind. Second pictogram consists of several information blocks. The bottom part of an arrow – a triangle (fig. 2.1). In its two bottom corners three small circles are shown (fig. 2.2). One circle – in the corner. It is an individual cell. It is similar to fig.1. Above this circle are shown two circles which represent two individual cells. Two half-arches above them represent a part of borders of these cells. This way the principle of the united consciousness formation is shown. The principle of the united consciousness formation: in the result of two individual cells unification the united consciousness cell with the expanded brain area is formed. The expanded areas of a brain of the united cells just show big arches above three circles in the corner of triangle. It is necessary to consider, that each individual cell is a presentation of human being. So, each two individuals form one uniting consciousness cell. The consciousness of human being corresponds to the fourth level. The united consciousness of mankind corresponds to the fifth level – the highest. ETC inform, that in universe five levels of consciousness are developed. On fig. 2.3 in each bottom corner of a triangle are placed four circles. It means, that this is information about the fourth level of consciousness – about human being. Cell of the united consciousness of our civilization will have a huge brain area which represents Yarnbury Castle. Association of consciousness of many people is shown by united parts of arches, going upwards arrow (fig. 2.4). This association of cells leads to imposing of their brain areas and formation of a peaked oval of dematerialization. Above two last parts of arches two small circles and a figure reminding an eye are shown (fig. 2.5). (fig. 2.5). It is surrounded with a peaked oval of dematerialization. 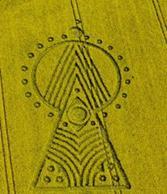 This figure is named by crop circles researchers as “an Eye” and is presented in many crop circles (fig. 2.6). The circle in the center of an eye is a brain area of an individual cell or the united consciousness cell. In the upper right corner (Fig. 2.7) of the triangle (Fig. 2.1) is shown a small circle. This is an individual cell. Two sides of triangle placed above it form an arrow. Above this arrow are placed four other arrows. All together – five arrows. This number means the fifth level of consciousness. They are placed in a large circle in the top of the pictogram 2. These arrows make upward movement. They point to the Yarnbury Castle which represents the united consciousness cell with huge brain area. The Yarnbury Castle shows a united consciousness of civilization of Earth. Four arrows are shown in full. Fifth arrow has missing top. These arrows are in a large circle on the top of triangle (Fig. 2.8). This large circle presents a united cell of civilization. This is analogous to the cell, presented by Yarnbury Castle (Fig. 3). Around this circle are small circles. These are individual cells. On the top of the large circle is placed a big circle, above it is shown a small circle (Fig. 2.9). Big circle is the united consciousness cell - similar to the Yarnbury Castle. All arrows point on it. It shows the main idea of the pictogram - the transition from individual consciousness to the united consciousness of civilization (Fig. 2.10). Fifth unfinished arrows indicate further - across the road to the Yarnbury Castle. Small circle at the top - is an individual cell. It is given for comparison and reminders. Hence, the goal of the pictogram – show the necessity of the transition from individual consciousness to the united. What caused this need? Why ETC point on this idea in all blocks of the pictogram? It turns out that unified consciousness has action. This action is very powerful - it can transform the body. It is necessary for flight in universe and allows to overcome the thousands of light years. ETC transferred the body to another sublevel of the material world and make a flight. We also have to make a body transformation in order to move to another level of the material world into a new cycle of life. The reason of our transition is connected with beginning of global cataclysms in the result of weakening of Earth’s magnetic field. It will be very soon. ETC warn that there is no other way to avoid cataclysms. The united consciousness action of ETC is very strong. Therefore, only a few people can fly through the universe. Our action is very weak, because we are the young civilization. We can cause a similar effect only by uniting the consciousness of the entire civilization at the same time. ETC inform that cataclysms will never stop. They will grow, because they are related to the beginning of the destruction of our planet. We work under this research over 15 years. We have deciphered thousands of ETC pictograms, and even composed a dictionary, which contains 200 most common ETC symbols. ETC are on the Earth for a long time. For thousands of years they have built a many objects-pictograms, creating the system of information transmission (SIT). SIT enveloped the whole world. However, all these objects transfer study information. Among them are: Stonehenge, stone circles Avebury, barrow-pyramid Silbury Hill (England), idols of Easter Island, underwater pyramids and temples Yonaguni and Okinawa (Japan), the Mexican pyramids the Moon and the Sun (Mexico), a multilevel complex of Peru: Sillustani, Sacsayhuaman, Cusco, Оllantaytambo, Tambo Machay, Pisac, Moray, Maras, a modern wonder of the world Machu Picchu, the Nazca Lines (Peru) and others. ETC inform about future of mankind. 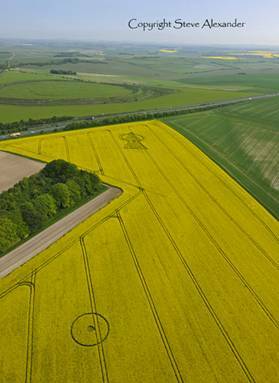 Emergency messages ETC transfer through crop circles.